1 May - On a bright, warm day the frogs were out around the ponds in higher numbers than yesterday. I managed to count 63 without getting into the awkward corners, with perhaps half that number being 1-2 years olds - so much for frogs leaving the pond once spawning is over! In the bright conditions they were much more sensitive to my walking past the pond, causing a series of splashes as they dived for cover. The one photographic record for today comes not from the ponds but the bamboo down the West Wing where this damselfly landed to 'sunbathe'. Here are close-ups of the front and rear. 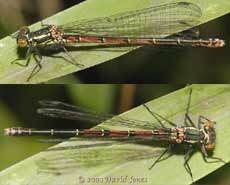 Although my guides have failed to match it, a look on the web suggests that it is indeed a Large Red Damselfly (Pyrrhosoma nymphula), probably an immature female. 2 May - Another bright, sunny day has the frogs out all around the ponds. To give you a sample of what I mean, this group was 'sunbathing' on the north side of the pond at noon. 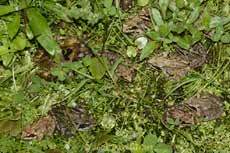 If you look very carefully at the larger version of the image you should be able to find fourteen frogs ( a couple are well hidden!). Just one other photograph today, of a small black insect measuring just about 1cm in length, which appeared on a Flag Iris leaf late this afternoon. 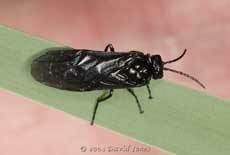 Having drawn a blank in my insect guides I shall have to search elsewhere for an ID - Thanks to Steve McWilliam of rECOrd for identifying it as a sawfly (Rhadinocerea micans). 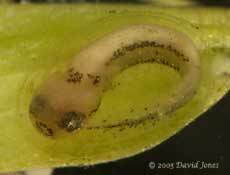 Back in 2002 Steve identified the larvae of this species for me. 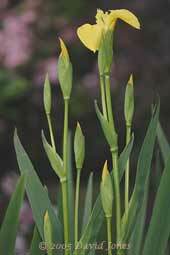 The Flag Iris is their only known food source. 10 May - First of all, an overdue update on developing newts. I have photographed two embryos today. Both move about within the confines of their eggs, giving us a chance to get different views. The first one shows that it has started developing pigmented markings. Its tail is still a stump with no sign yet of the fin that will develop. Similarly, the external gills are still just stumps and there is no external sign of eyes as yet. This second embryo is much more advanced. 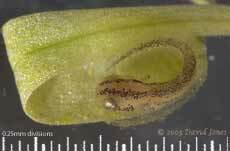 Seen here in the folded leaf of a Starwort plant, it now has developed all the features that are missing in the first embryo. The lines of pigmented spots over the top of its head are starting to give it the features of the juvenile newt (known as an eft) that I photographed on the 16th April. This image shows it's underside after it moved (very conveniently!). The underside is almost clear of dark pigment, other than the band along the side and across the neck. The ring of spots at the front surprised me, and seem to indicate the position of the (developing) mouth. The eyes are now obvious, and bulge out slightly. The way they reflect light suggests that they are well developed, although I don't know at what stage the embryo is able to use its sense of sight. I spent a short time by the pond this morning, looking for newt embryos that would be suitable for photography. There are lots to be found, but most are too wrapped up in leaves for me to use. I only looked at one corner, but the Starwort (Common Water Starwort - Callitriche stagnalis) has now spread right across the pond. 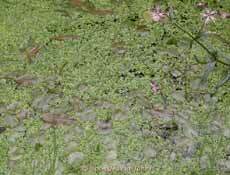 Along with the leaves of the Fringed Water-lily and the Pondweed (Potamogeton sp.) it now covers the surface, leaving me wonder how many newts are developing in there at the moment. The Starwort has to have the most inconspicuous flowers of all the flowering plants in the garden. It has 'come into flower' over the last few days. In this photograph you can see an anther that has just burst open to release its pollen. Behind the 'star' of leaves, the two 'horns' that stick up are stigmas, waiting to be pollinated. 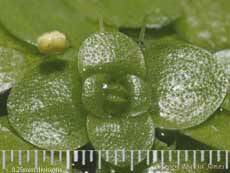 Both anthers and stigmas grow up out of the water from buds at the bases of the plant's leaves. I will try to get some photographs to show this over the next few days. I don't know if the Starworts rely on insects for pollination or, perhaps water splashing when it rains, but one insect species that is at the right sort of scale to do this job has to be this fly which spends nearly all its time on the floating leaves. 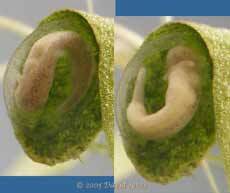 Photographed on Starwort leaves (you can see an anther in the upper image) it measures just under 1.5mm in length. As summer approaches these will appear in increasing numbers and it is fascinating to see them chasing round after mates. 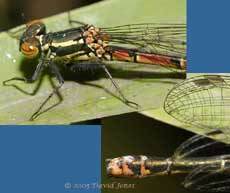 Its wing venation suggests that it is Psilopa nitidula. 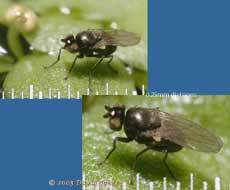 Known as a shore-fly, it lives on ponds and streams. 26 May - I had hoped to do more with the pond this month. When we return from our Cornish break I will need to thin out some of the Starwort on the pond surface. That should give me the chance to catch up with the newt development photographs. The frogs still gather in groups around the pond, especially on warm days like today, but they can now be found hunting in just about any part of the garden. It's a pity that it was cool on the day the BBC came so that there were only a few in sight. No frogs pictures today however, but I had to record the opening this morning of the first Flag Iris flower. As this picture suggests, we will have a good display this year - I just wonder how many flowers will have been and gone before we return home!